One thing that I find so inspiring in South Africa is the countless people who participate in miraculous activities as they strive to make their communities better. In working for the Anabaptist Network in South Africa, my wife and I have the honour of meeting different people all around the country and listening to the different ways these normal people do extraordinary things. They often risk their own comfort, well-being and security in order to help others. They demonstrate daily an alternative way of being that seeks the welfare of someone else over their own, that serves others rather than themselves, and that strives toward peace and justice, not just for themselves but for everyone. It is a different way of living. I call this a different way of living or being because we in the West are regularly encouraged to focus on ourselves, our own well-being and happiness, rather than on someone else. We see this regularly portrayed in TV commercials in which happiness and success are depicted as getting the keys to the car we always wanted or growing our business in order to afford the luxurious life in an imaginary land where bigger is better, success means power, power means influence, and influence means progress. The focus is on securing our own success, power and influence. Throughout the Bible, however, God embodies—and asks us to embody—a different method, one that challenges the assumption that success, power and influence are gained by focusing on us. In fact, God’s method often turns these assumptions upside-down. In I Samuel 16:1-13, Samuel is instructed by the Lord to go to the house of Jesse because God has chosen a king from among Jesse’s sons. Although Samuel is scared that King Saul, who has been rejected by God and is to be replaced, will retaliate, he goes to find this king that God has chosen from within Jesse’s household. Jesse, although not sure whether Samuel comes in peace, welcomes Samuel into his home. The purpose of Samuel’s visit, it is made clear, is to find the one whom God has chosen as the next king and then to anoint him. Jesse begins by bringing the one who would be the most obvious choice, his eldest son who is presumably a tall, handsome young male, a description that is strikingly similar to that of Saul a few chapters before. Samuel is told, however, not to look at the young man’s appearance, as the Lord has rejected him. The Lord is moving away from the Saul archetype. In response, Jesse then brings the second-eldest son, the next likely. But he, too, is not the one whom God has chosen. Jesse then brings five more of his sons before Samuel. None of them is the one whom God has chosen either. Samuel asks Jesse whether these sons are all that he has? Jesse admits that there is one more: David, the youngest son who is tending a flock of sheep. 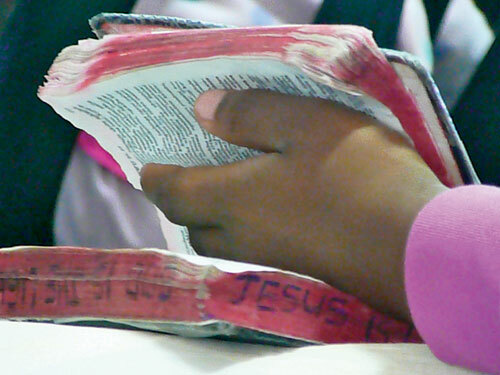 This is the one, God tells Samuel: “Arise, anoint him; for this is the one!” (I Samuel 16:12). Everything points away from David as being the logical choice. He was the youngest and presumably smaller. Yet it was David whom Samuel wanted to meet. And it was David whom Samuel anointed. By the elders of Israel to be a king over Israel (II Samuel 5:3). Through the act of anointing by Samuel, David has been set aside for a divinely appointed task. A transition in his status has been marked, and his anointing serves as a foreshadowing of the time when he will become king. In having Samuel anoint David, God turns common sense and logic upside-down. We see a glimpse of God’s alternative method. John 9:1-34 reveals another example of God’s alternative method. In this story Jesus heals a man who was born blind. It begins with a theological question: Who was it that sinned that made this beggar blind, him or his parents? The answer: Neither. Jesus declares that he was born blind so that “the works of God should be revealed in him.” Without being asked, Jesus, of his own volition, then heals this blind man. The act is significant, in that it demonstrates Jesus’ concern about the physical well-being of others. The way Jesus heals the man is also quite interesting. Jesus makes clay from dirt and his saliva, and anoints the eyes of the blind man. The creation of this clay is most often interpreted as a way of preparing medicine, as it was believed at this time that saliva had medicinal properties. It is this act of creating medicine that breaks the Sabbath law. It is because of this act that the Pharisees sought to punish Jesus. This act, however, serves a dual purpose. The anointing of the man’s eyes could also be seen as setting this man aside for a divinely appointed task. In response to being healed, this formerly blind man challenges the Pharisees, the ones who are in power, that their interpretation of the law and their understanding of the identity of Jesus are incorrect. This act of rebellion gets the beggar thrown out of the synagogue, a serious thing for a Jew whose centre of community life was the synagogue. We are not told whether this man declares Jesus as the Christ, but we are told that the Pharisees had decided that the consequence for declaring Jesus as the Christ was expulsion from the synagogue. How do we participate in this alternative, logic-defying, revolutionary story? Do we recognize the faithful responses to God’s will, responses that sometimes look terribly ineffective, or do we write them off exactly as that—ineffective? Are we willing to participate in countercultural activities, recognizing that we may stand out? Like the beggar, are we willing to call into question the very nature of power as it stands, which takes advantage of the poor and benefits only a few, by declaring that someone else is Lord, that someone else is the true light, that someone else is the anointed one and worthy of worship? How do we participate in, or align ourselves with, this alternative understanding of power? These are challenging questions that can cause us to think and revisit how we participate in God’s alternative methods. My hope is that we can be challenged by them as we continue to wrestle with how to walk faithfully as children of the one true light and as witnesses to this alternative way of being—in which the powers have been overcome by the cross, not the sword; the poor are the ones who are blessed; we heed the calling to serve others, rather than to rule over them; and peace shall reign, not war. Andrew Suderman and his wife Karen are Mennonite Church Canada Witness workers. 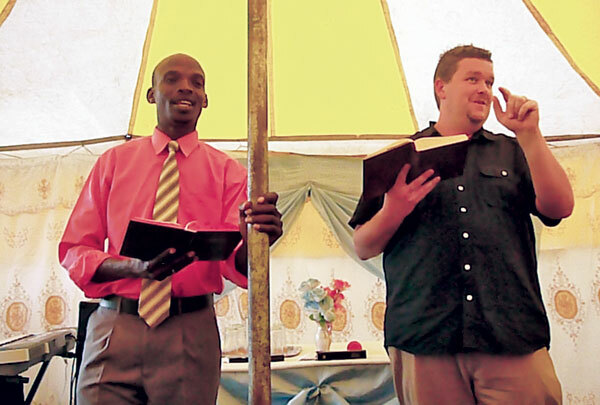 Andrew serves as the director of the Anabaptist Network in South Africa (anisa.org.za). Adapted from a sermon Andrew preached on April 3, 2011, at St. Matthew’s Anglican Church, Pietermaritzburg, South Africa. 1. Andrew Suderman says he is inspired by the values of South Africans who work not for themselves, but for others. Have you experienced other cultures, families or settings where attitudes are different from what you are used to? Do you agree with Suderman that we are taught to pursue success, power and influence? 2. Can you think of biblical examples where God acted in unexpected ways (other than choosing the shepherd David as the next king)? How have you seen God work in surprising ways in your church, community or family? Why do you think God uses “alternative methods” that seem to defy logic? 3. Do you agree with Suderman that sometimes a faithful response can appear ineffective? Why do we assume that it is so important to be effective? 4. Is marching in the street a legitimate countercultural activity? Can demonstrations challenge society’s views or bring change? Under what conditions would you march in the street?